Paleolithic paintings in El Castillo cave in Northern Spain date back at least 40,800 years  making them Europe's oldest known cave art, according to new research published today in Science. The practice of cave art in Europe thus began up to 10,000 years earlier than previously thought, indicating the paintings were created either by the first anatomically modern humans in Europe or, perhaps, by Neanderthals. Fifty paintings in 11 caves in Northern Spain, including the UNESCO World Heritage sites of Altamira, El Castillo and Tito Bustillo, were dated by a team of UK, Spanish and Portuguese researchers led by Dr Alistair Pike of the University of Bristol, UK. As traditional methods such as radiocarbon dating don't work where there is no organic pigment, the team dated the formation of tiny stalactites on top of the paintings using the radioactive decay of uranium. This gave a minimum age for the art. Where larger stalagmites had been painted, maximum ages were also obtained. 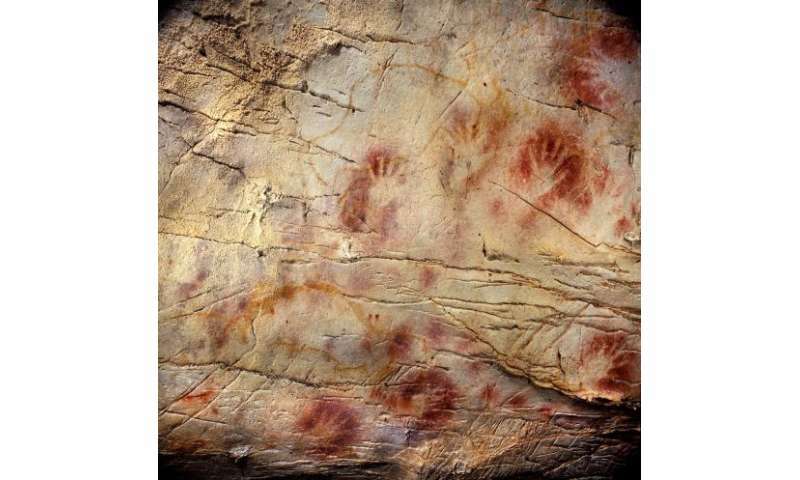 Hand stencils and disks made by blowing paint onto the wall in El Castillo cave were found to date back to at least 40,800 years, making them the oldest known cave art in Europe, 5-10,000 years older than previous examples from France. A large club-shaped symbol in the famous polychrome chamber at Altamira was found to be at least 35,600 years old, indicating that painting started there 10,000 years earlier than previously thought, and that the cave was revisited and painted a number of times over a period spanning more than 20,000 years. Dr Pike said: "Evidence for modern humans in Northern Spain dates back to 41,500 years ago, and before them were Neanderthals. Our results show that either modern humans arrived with painting already part of their cultural activity or it developed very shortly after, perhaps in response to competition with Neanderthals  or perhaps the art is Neanderthal art." The creation of art by humans is considered an important marker for the evolution of modern cognition and symbolic behavior, and may be associated with the development of language. Dr Pike said: "We see evidence for earlier human symbolism in the form of perforated beads, engraved egg shells and pigments in Africa 70-100,000 years ago, but it appears that the earliest cave paintings are in Europe. One argument for its development here is that competition for resources with Neanderthals provoked increased cultural innovation from the earliest groups of modern humans in order to survive. Alternatively, cave painting started before the arrival of modern humans, and was done by Neanderthals. That would be a fantastic find as it would mean the hand stencils on the walls of the caves are outlines of Neanderthals' hands, but we will need to date more examples to see if this is the case." The findings are particularly significant because cave art has always been difficult to date accurately. Dr Pike said: "Engravings and, in many cases, paintings lack organic pigments or binders suitable for radiocarbon dating. Where suitable material  such as charcoal pigments  does exist, only small samples can be dated to minimize damage to the art. This magnifies the effects of contamination and produces less accurate results. "Instead, we measured uranium isotopes in the thin calcite flowstone growths that formed on the surfaces of the paintings and engravings to date the art. This technique, known as uranium-series disequilibrium, is used extensively in Earth Sciences and avoids the problems related to radiocarbon dating." Team member and dating expert Dr Dirk Hoffmann of the National Centre for the Investigation of Human Evolution (CENIEH) in Burgos, Spain said: "The key development was our method to date tiny tiny calcium carbonate deposits similar to stalactites. We can now date samples of just 10 milligrams  about as small as a grain of rice. This has allowed us to find samples that had formed directly on top of hundreds of paintings, whereas the larger stalactites were much less frequent." Cave art specialist Dr Paul Pettitt of the University of Sheffield, UK said: "Until now our understanding of the age of cave art was sketchy at best; now we have firmly extended the earliest age of European cave art back by several thousand years, to the time of the last Neanderthals and earliest Homo sapiens. These earliest images do not represent animals, and suggest that the earliest art was non-figurative, which may have significant implications for how art evolved." More information: 'U-series dating of Palaeolithic Art in 11 Caves in Spain' by A. W. G. Pike, D. L. Hoffmann, M. García-Diez, P. B. Pettitt, J. Alcolea, R. De Balbín, C. González-Sainz, C. de las Heras, J. A. Lasheras, R. Montes, J. Zilhão in Science, June 15, 2012.